Needless to say that these went straight into the bin. Luckily I had enough mixture for another go so into they oven they went and this time I sat and watched them through the oven door, they swelled up beautifully but started going brown on top so I took them out and as soon as I did they collapsed. The oven temperature must have been too high. My flatmate found me in the kitchen scraping the ruined remains off of the baking sheet in an attempt to salvage something. 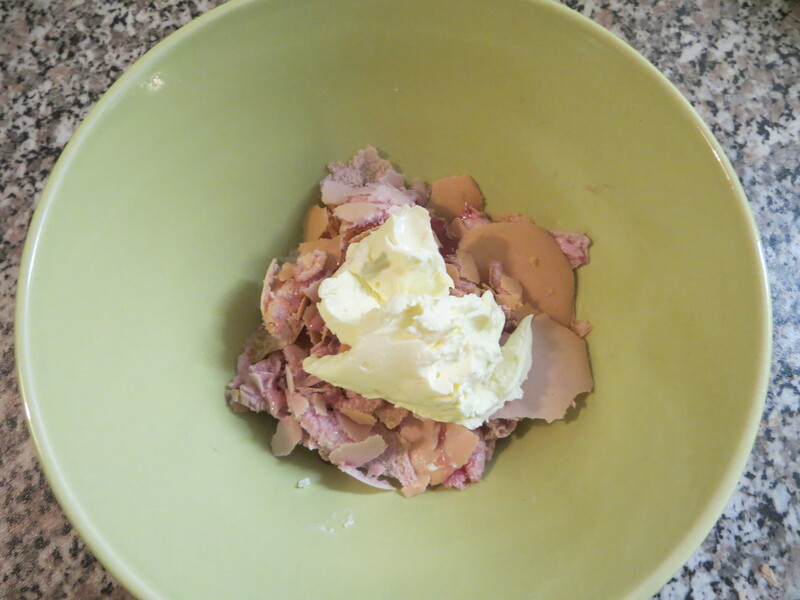 In the end I managed to get them in a bowl and dolloped some double cream on top. Better than nothing. 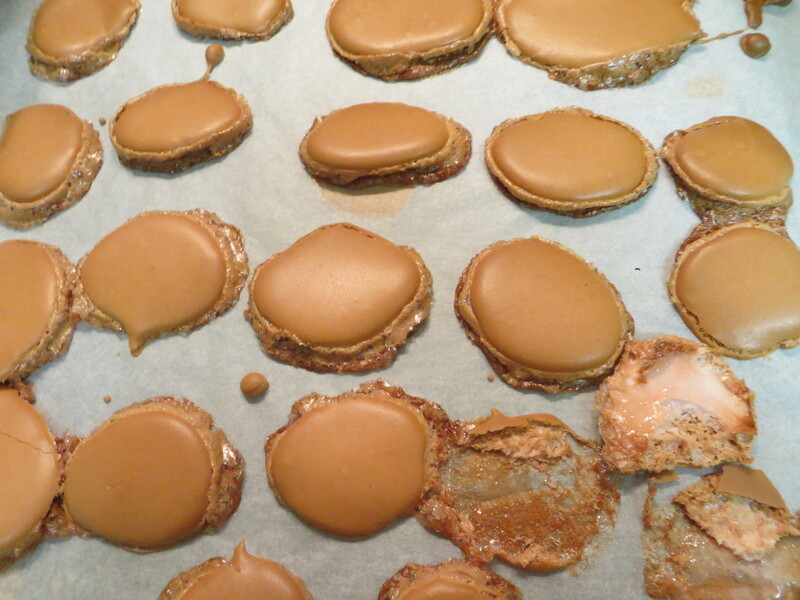 Posted in Baking, Cooking, Food, Macaroons, Uncategorized and tagged kitchen, macaroons, ruined, sugar. Bookmark the permalink. Once more I apolagise for my absence! My exams are next week so after that I shall be able to give this blog my full attention! 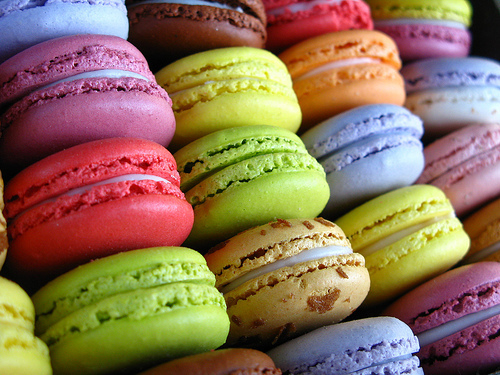 I have always admired macaroons, they are so pretty and colorful, when I see them on the television or in markets they always look so simple. I thought that they would be perfect for the blog! But once more, disaster struck! They were going so well, I followed the recipe exactly and the mixture tasted right but when I took them out of the oven they were all flat and most refused to come off of the baking tray, despite my special non-stick sheet. I was also slightly ambitious I admit, as I had only tasted macaroons once or twice before, so when I tasted them I wasn’t very keen, or that might just be because of my cooking, I’m not sure. 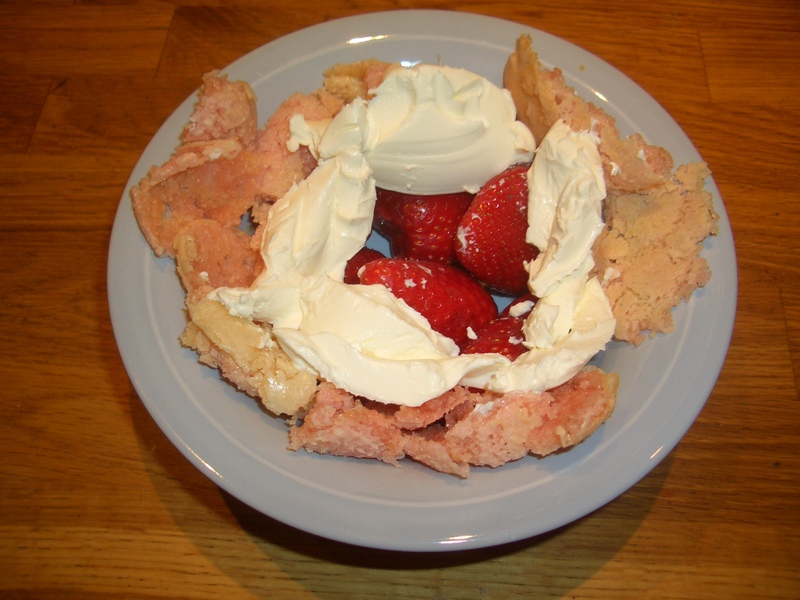 Eventually though we had them in a bowl with some mascarpone and strawberries, which was quite delicious. For this photo I was going for the “birds nest” look, just to make the macaroons look more interesting, the messy macaroons and mascarpone is the nest and the strawberries are the eggs. 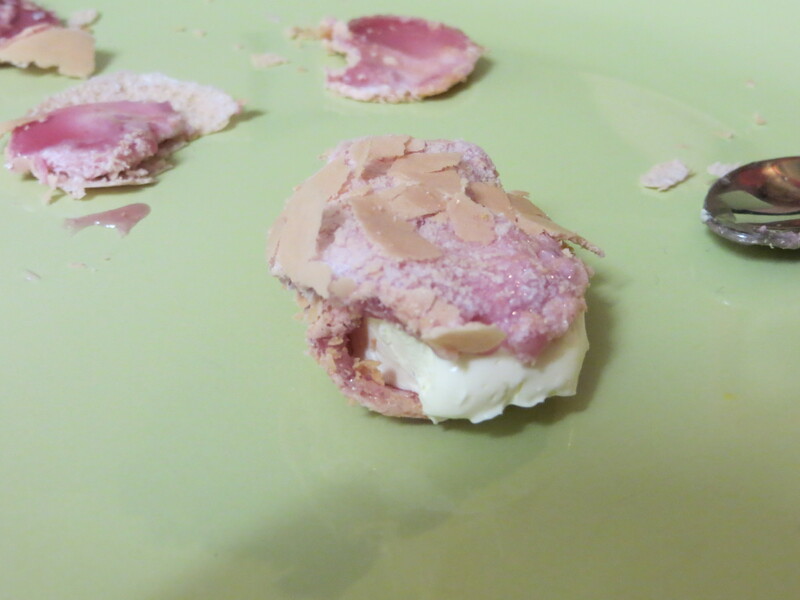 Posted in Uncategorized and tagged macaroons, mascarpone, mess, strawberries. Bookmark the permalink. My boyfriend goes to University in a big town a few hours away and we decided to go and spend a few days over there. We went ice skating, which I am still not very good at but I managed to let go of his hand for a bit! 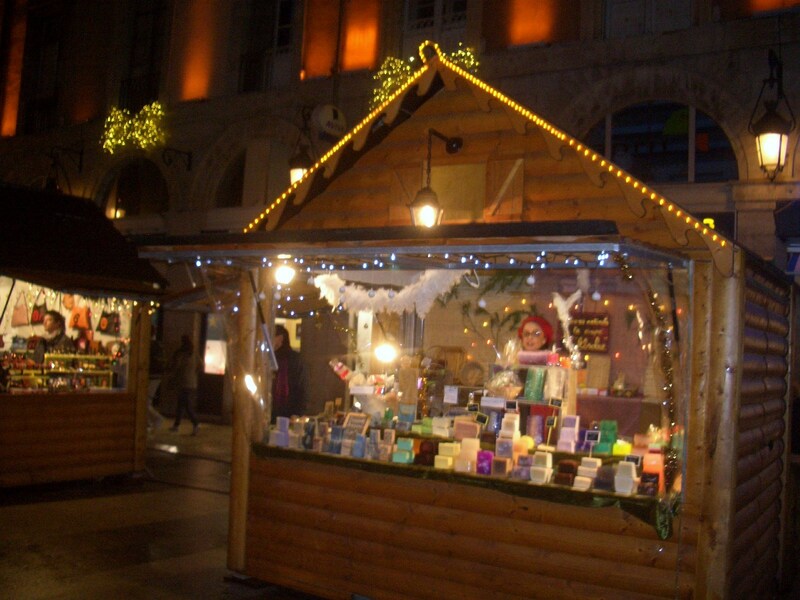 Then we went to the Christmas market which was so beautiful, there were fairy lights everywhere, Santa Claus was giving presents to kids, lots of chalets were set up and people were selling stuff in them, mostly food like candyfloss, soup, chocolate, hot wine, hot chocolate, etc. We tried something called “chicken milk” which, believe it or not, isn’t actually from chickens, it tastes a bit like coconut flavoured pancake mixture. But the best bit was the giant food everywhere and don’t worry! I thought about you dear readers and took lots and lots of photos! This is the fountain which, as you can see, had been turned into a giant plate stand! How cute is that? These are the fairies that were walking about on stilts! I couldn’t get the stilts in unfortunately because they were too tall! 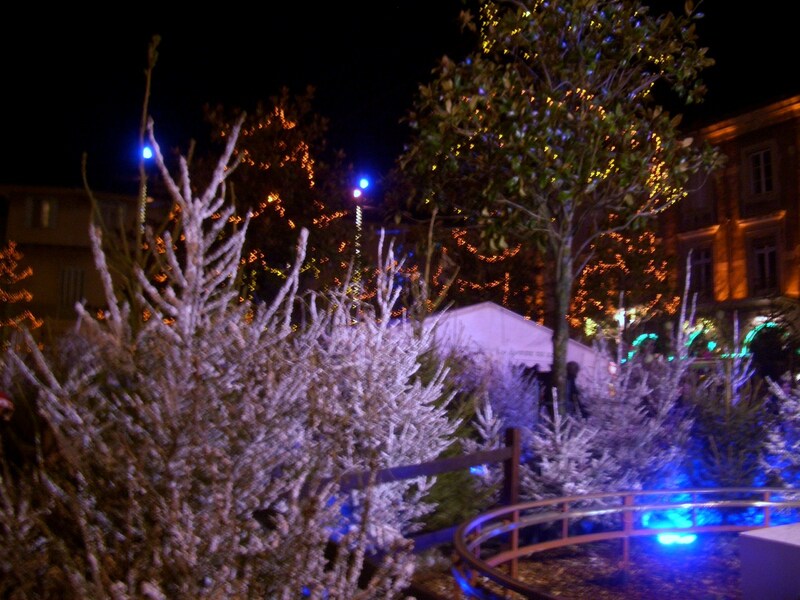 The magic forest lit up with beautiful fairy lights! 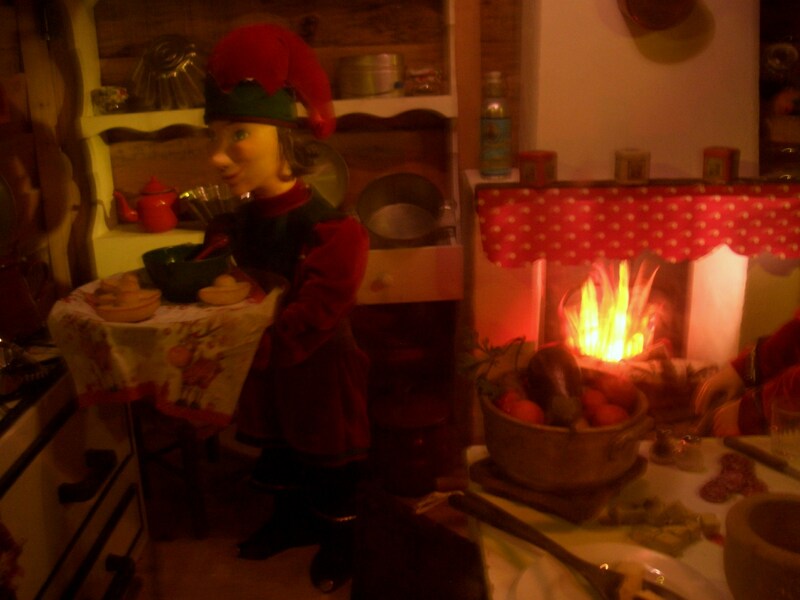 The elves (that I actually found slightly creepy) making some traditional madeleines in their little house. My favourite decoration! 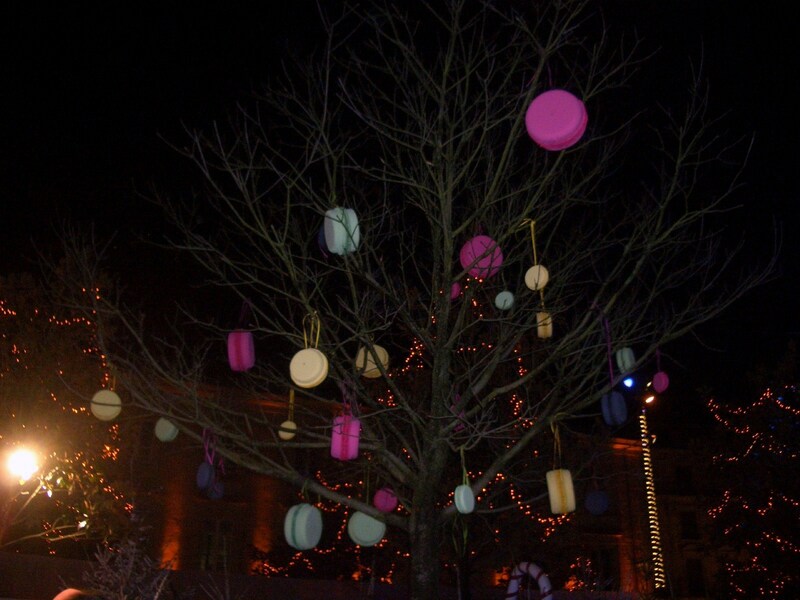 I wanted to climb into the tree and eat them all, even if they weren’t real. 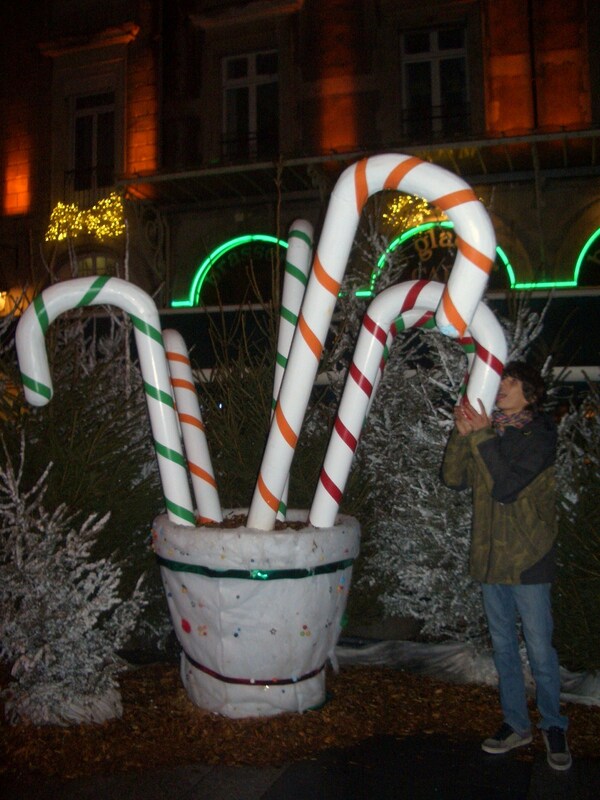 My boyfriend with some giant candy canes, he has a fetish for candy canes and was delighted with these! 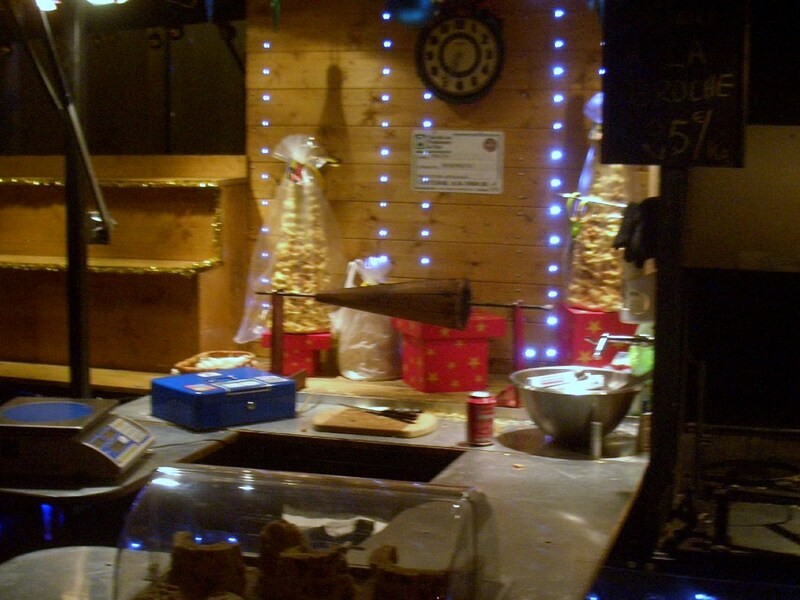 A nice lady selling macarons in her chalet, she even put a beret on so you know I’m in France! 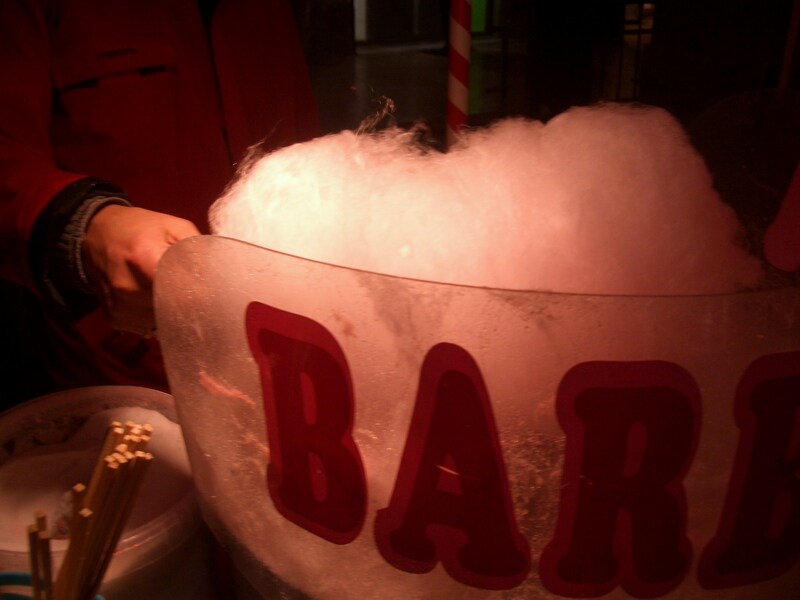 Candyfloss! Or “Barbe a Papa” (dad’s beard) as the French call it. This was interesting, it’s a bit like a chocolate christmas tree kebab if you see what I mean. They melted the chocolate onto the wooden triangle and it came off in the shape of a christmas tree! 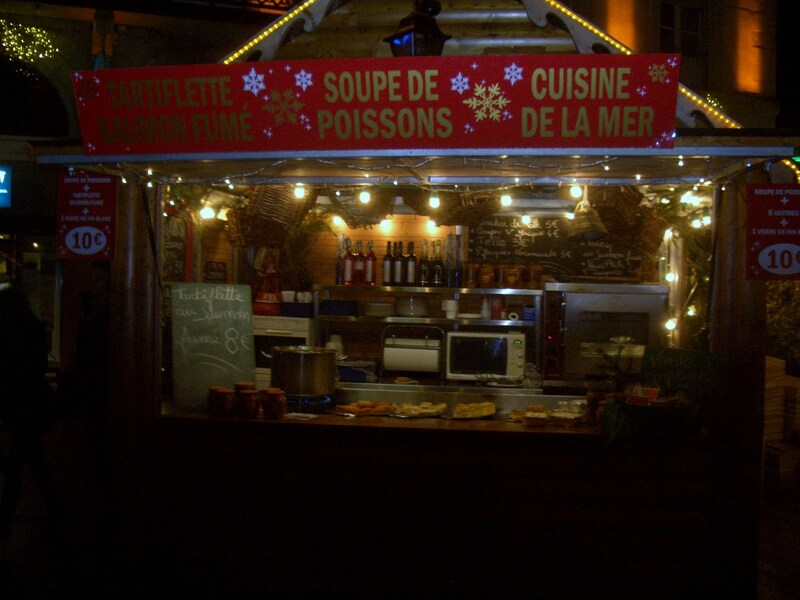 And finally a chalet selling some seasonal (for the French) food : tartiflette, fish soup, and seafood. 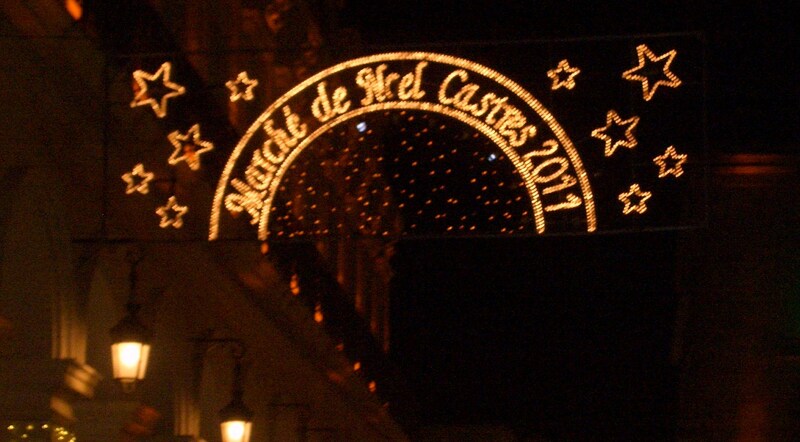 The French all eat seafood on Christmas day, I’m glad the English don’t because I don’t like seafood! So there were my photos! I hope you enjoyed them! I hope you all had a lovely Christmas! 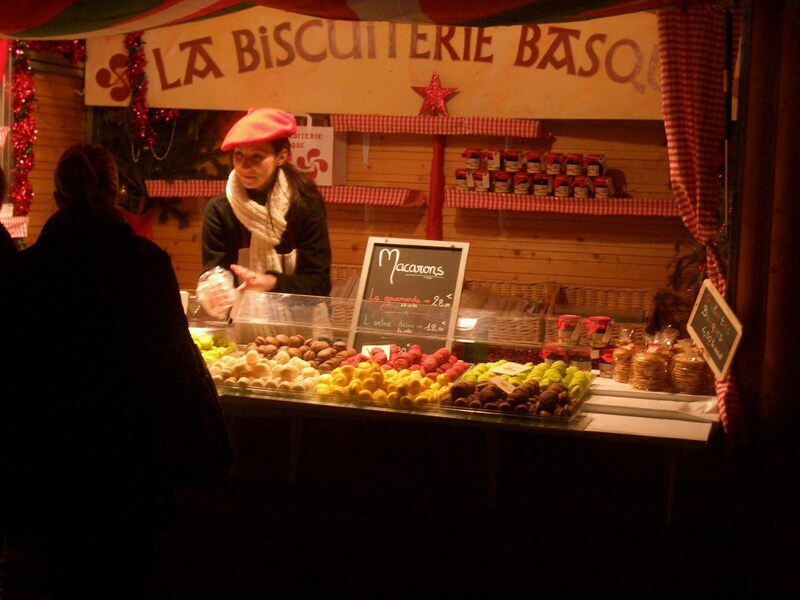 Posted in Food, Markets, Uncategorized and tagged beret, candy canes, candyfloss, Castres, chalet, chocolate, christmas, elves, fairy, France, French, French market, hot chocolate, hot wine, macaroons, market, soap, soup. Bookmark the permalink.